It can be a real challenge to find an available slot with your manicurist this Chinese New Year. Moreover, if you do find one, you’ll most probably be put off by the hefty seasonal surcharge. With that said, you don’t have to leave your nails bare and dull for the festive season! 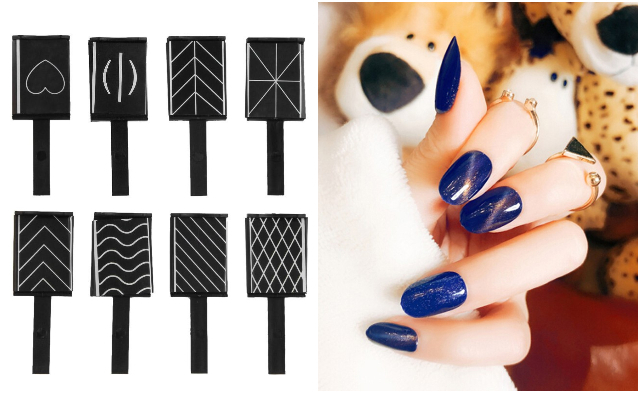 We’ve compiled a series of useful nail tools that can help you achieve your desired nail art designs within the comfort of your home! Nail stamping is a wonderful invention for those who’re not steady with their hands! It’s perfect for creating plaids, florals and other complicated nail art designs! This swift and simple tool requires some practising, but the results are professional and satisfying! To begin nail stamping, you’ll need a nail stamper, scraper (an old gift card will suffice) and a nail stamping plate. Go for a transparent nail stamper (available on Body store) — it makes positioning your stamp designs easier! You’ll also need special nail stamping polish, which boasts a thicker and more pigmented formula than regular polishes. How To: First, pick a nail art design of your choice, such as this plaid design nail stamping plate (available on Beyond Imagine)! Coat half of the chosen design with the special nail stamping polish. Then, swiftly scrape the polish across the entire nail art design with the scraper. Gently roll your nail stamper over the stamping plate before transferring the design onto your nails with a firm press. It may take a few tries to get the perfect result, but practice makes perfect! With nail stamping, you can create even the most intricate nail art in Singapore for Chinese New Year! 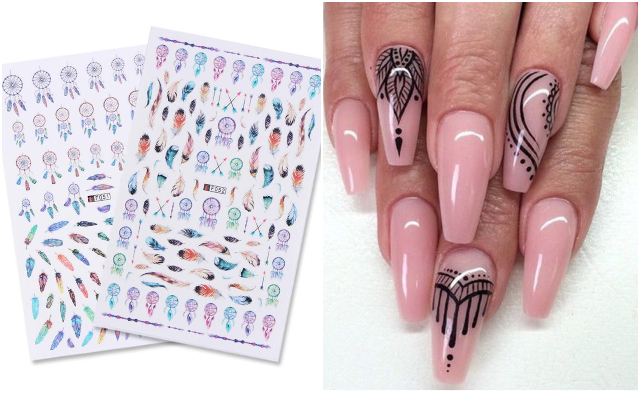 A great alternative to those who struggle with nail stamping, nail art sticker stencils produce similar professional results in much shorter time! Choose from interesting nail art designs such as mermaid (available on wunjea.sg) or starburst (available on flying1.sg)! However, do note that nail art sticker stencils aren’t as cost-effective as nail stamping as they’re for one-time use only. How To: Nail art sticker stencils are pretty foolproof! Smooth the stencil over your nail, and apply a coat of contrasting polish shade for the nail art design to pop! Lastly, apply a thin layer of top coat for a longer lasting nail art in Singapore! 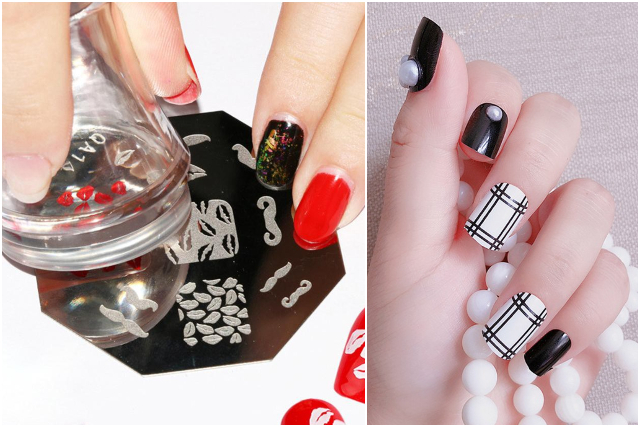 Everyone will be impressed with your attractive nail art designs at Chinese New Year gatherings! Nail rhinestones have evolved beyond the typical tacky and colourful gemstones to unconventional shapes and designs — think: crushed shells, metallic hollow rhinestones (available on huishu.sg) and gold chains! 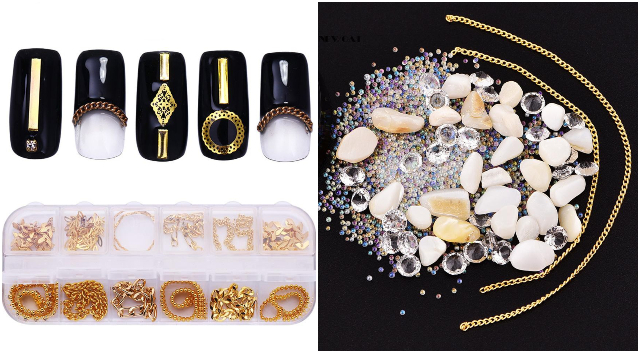 With the right combination, nail rhinestones can be used as beautiful accents to enhance your nail art in Singapore! How To: Attaching nail rhinestones is quick and easy! If you’re attaching a rhinestone onto regular nail polish, you’ll need a nail glue for better adhesion. Simply brush on some nail glue on the back of the rhinestone before positioning it on your nail. Let it dry thoroughly, then apply a top coat to seal in your nail art design! Meanwhile, if you’re attaching a rhinestone onto gel polish, you’ll need to use a UV gel. Apply a small blob of UV gel onto your nail before placing the rhinestone in position. Cure your nail art design in a UV nail lamp. Thereafter, apply a generous layer of UV gel over your nail to ensure the entire rhinestone is covered. Once again, cure your nails and voila, you’ve got glittering nails to show off during Chinese New Year! Often referred to as the Spring Festival, Chinese New Year is the perfect time for some floral nail art in Singapore! Popular for their pastel hues and dainty petals, it’s no wonder dried flower nail art designs have been all the rage in Singapore recently! 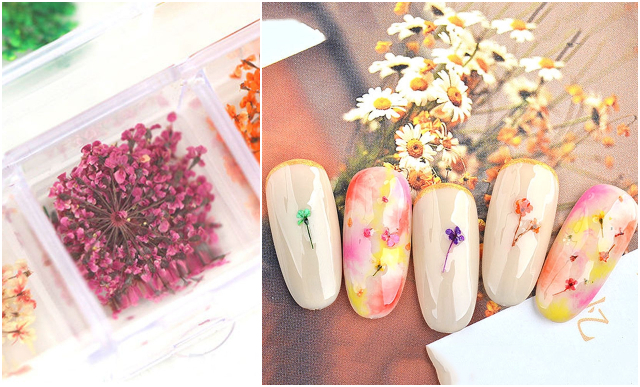 Introduce some blooms into your nail art design with dried flowers of different sizes and shades! To create a more prominent accent nail art in Singapore, go for a bigger dried flower (available on yvette.sg). For a subtle whimsical effect, opt for smaller dried flowers (available on gooq01.sg)! How To: As dried flowers are very delicate, you need to be gentle when handling them. Snip the dried bouquet into small flowers. Soak the dried flowers in water for about three to five minutes to soften the petals for easier application. Thereafter, take the flowers out with a tweezer and blot dry carefully. Apply a coat of clear gel polish before laying the dried flower onto your nail. Using a small scissors, trim the protruding petals and press the nail art down gently. Cure it under a UV lamp and follow up with another coat of clear gel polish. Seal everything in by curing the nail! Prosperity begins from your nails! This Chinese New Year, give your nails a treat by using gold foils to create dazzling nail art designs! The reflective gold foil gives off a classy look, making it the perfect match for your stylish Chinese New Year outfits! 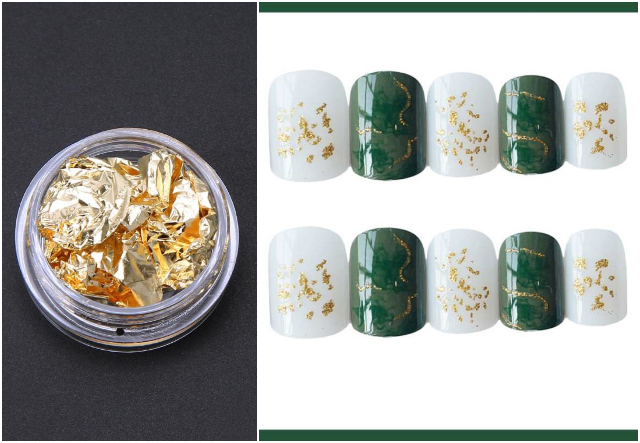 How To: Creating gold foil nail art in Singapore is easier than it looks! Using two cotton buds, gently rip the edge of the gold foil until you accumulate sufficient tiny gold flakes for your nail art design. Gold foil is extremely delicate, so handle with care! Thereafter, coat your nails with a layer of clear polish (it can be either regular or gel polish). Pick up the gold flakes using a small nail brush, and position them on your nails to create your desired nail art! If you’re using regular polish, let the clear polish dry thoroughly before applying one to two more layers of top coat to seal in the gold foil. If you’re using gel polish, cure your nail art in the UV lamp. Then, apply another generous coat and cure again. Customise your nails for Chinese New Year using holographic transfer nail foils! These foils are capable of creating glitzy nail art designs that dance under the light to display a glimmering spectrum of colours! Do you know what’s the best part about this nail art design? It’s unbelievably easy to create! Different holographic transfer nail foils give different results. 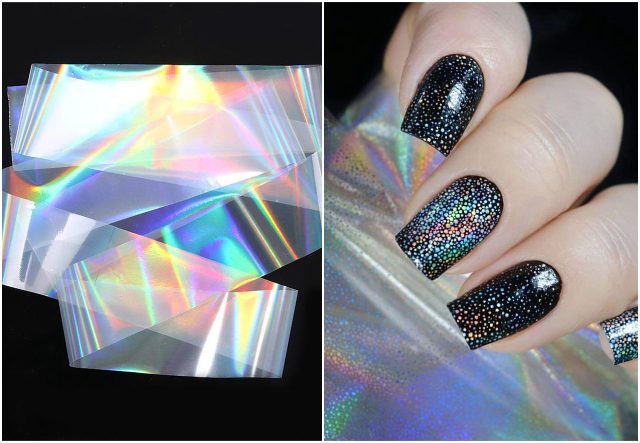 Check out these unique marble holographic nail foil (available on fengyun.sg) and floral holographic nail foil (available on xiaominmall.sg)! How To: If you’re using regular nail polish, you’ll need some help from a clear nail glue! Apply a thin coat of glue over your dried polish. Wait for your glue to dry and set before pressing the foil firmly onto your nail. You can rub the foil gently to allow for better design transfer. Thereafter, peel back the foil slowly to reveal your beautiful nail art design! Seal everything in with a top coat. 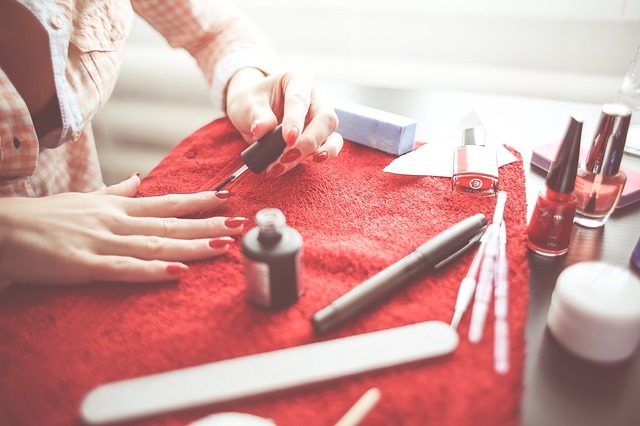 If you’re using gel polish, start with a base coat before using your desired gel polish colour. Cure the gel polish and you’ll find a tacky top layer. Taking advantage of this, lay the foil down and press firmly onto the nail. Gently peel back the foil and apply a layer of top coat to complete the nail art! Love hand-drawn nail art in Singapore? You don’t need to be a certified manicurist to create beautiful designs on your nails! 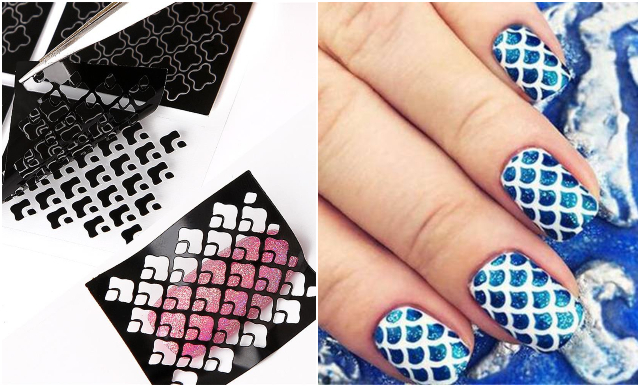 Nail art water decal is a ready-to-use nail art tool that facilitates the easy transfer of a design onto your nails. The design is printed on a special paper which slides off like a faux tattoo when soaked in water! 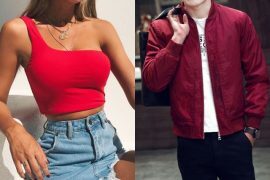 From roses (available on Thousand And One Night) to dream catchers (available on meshop.sg), you’re bound to find a design that’s perfect for Chinese New Year! How To: Paint your nails and get ready to decorate! Cut out the water decal you’ve chosen, remove the transparent protective film and soak it in water for about 10 to 20 seconds. Then, dry the water decal with a paper towel and gently slide the decal off the backing paper. Using a tweezer, pick up the water decal and position it on your nail. Smooth the decal flat onto your nails and let the decal dry down for about a minute. Lastly, apply a layer of top coat to make your manicure last longer! When it comes to nail art for Chinese New Year, don’t hold back — go big or go home with a set of flamboyant chrome nails! The magic behind these blinding nails lies in the chrome nail powder, which is a mixture of very finely milled glass, metal and pigments. 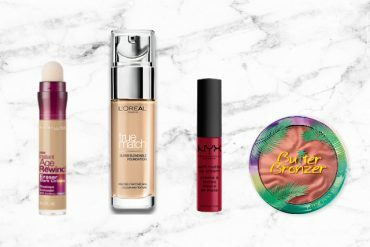 You can find various shades of chrome nail powders and holographic nail powders to create eye-catching nail art in Singapore! 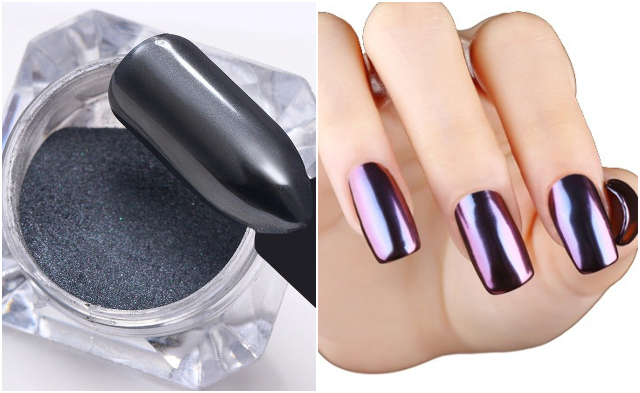 To achieve the best chrome nails effect, stick with a white or black gel polish as the base colour! How To: Prep your nails with a base coat and a gel polish of your preference. Add a layer of gel top coat and cure it in a UV lamp. Here comes the fun part — using a sponge applicator (available on Baik), buff the chrome nail powder onto your nails until you achieve a mirror-like effect. To prevent the chrome powder from rubbing off, seal the nail art design with a gel top coat! Are you a cat lover? If so, this nail art design is just for you! Similar to an actual cat’s eyes, the cat eye nail art in Singapore glows under light and changes in dimension at different angles. The effect is so mesmerising, it’s almost as if we are gazing deep into the galaxy. 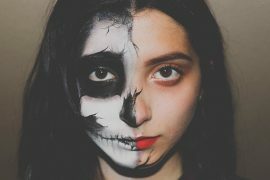 The cat eye nail art is made possible thanks to a special cat eye nail polish, which contains iron powder fragments that can be manipulated by a magnet. As the iron particles are denser, they sink to the base while you apply the polish. What the magnet does thereafter, is that it attracts the iron particles to the surface and keep them in place as the polish dries! Depending on the shape and pattern of your cat eye magnetic nail stick, you can create different cat eye nail art designs! Also, applying the cat eye nail polish on top of a base colour can drastically change the overall effect — we highly recommend using black gel polish as the base colour for a mystical result! How To: After you’re done curing your gel base coat under the UV lamp, apply a layer of cat eye gel polish. Immediately, hover the cat eye magnetic nail stick over your nail as close as possible for five to 10 seconds. Cure your nail under the UV lamp and repeat these steps again. Lastly, seal everything in with a gel top coat before curing it thoroughly! While all the nail art designs mentioned above can be done easily by yourself, cleaning up may be a huge hassle. Here’s a great trick to clean up unwanted polishes and pigments around your nail — apply a layer of nail liquid tape around your cuticles to catch any stray polish or nail art! Once you’re done, simply peel off the nail liquid tape and you’ll be left with neat and beautiful nail art in Singapore! Whether you’re receiving or distributing red packets this Chinese New Year, your nails are all ready to steal the show! Cooking may ruin your nails, check out these delicious Chinese New Year catering ideas to save you the hassle!